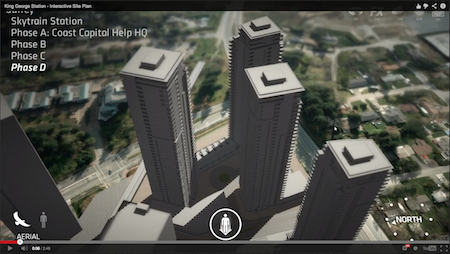 MDM Alumni Startup Company CatStatic Interactive’s latest project is a 3D interactive site plan for King George Station, a landmark mixed-use development located in Surrey, BC. The 3D model was created to help the PCI Group, a Vancouver-based real estate development and property management company, plan and promote the first phase of the site's development: The Coast Capital Saving's Credit Union's Help Headquarters. CatStatic was founded by 3 graduates from the Master of Digital Media program—Josh Kho, Luke Johnson and Fouad Hafiz. The company specializes in using cutting-edge game engine technology in new and exciting ways in the fields of architectural visualization, product demonstration, educational gaming and advergame marketing. The impetus for the company came from their final term pitched project. Previous projects include an interactive digital model for Great Northern Way Trust to aid in the internal planning and design of the new facilities on site. Prior to completion of our new building they created an interactive demo for the Centre for Digital Media to promote it and allow users to explore the features of our high tech facility before it was built.